Did I buy a 1973 Pontiac Grand Prix SJ on eBay? My 1973 SJ gold mine. I finally did it! I knew one day I would stumble upon a Grand Prix, one of my dream cars, in time capsule form, with the proper “SJ” pedigree. I finally bought the car to go with the tachometer that I found about three years ago. That’s the way we car guys operate, we buy parts for cars we don’t own (yet), and one day find the car to go with it. Presenting my 1973 Pontiac Grand Prix SJ 455 in Valencia Gold. That’s the stuff! I bought a bucket list car, however, that is not the end of the story. 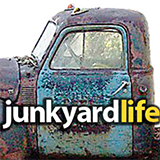 Junkyard Life Brother, Scott Andrews of Indiana, happened upon a story that Jody and I had written on a Colonnade-era Grand Prix. 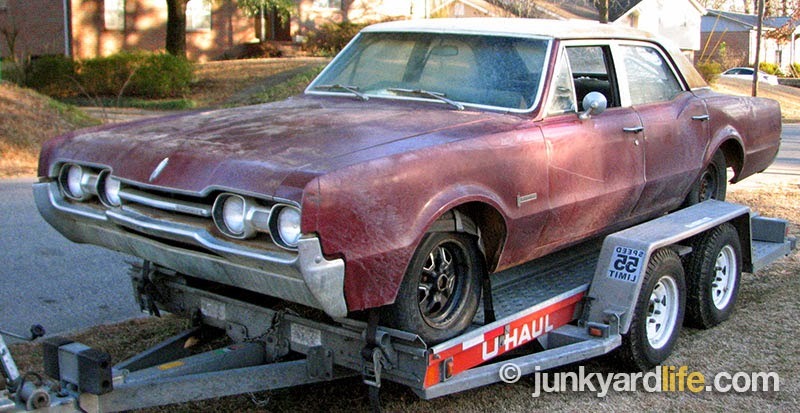 Scott, always a fan of this forgotten generation of Pontiacs, got excited and hit the Internet looking for an SJ Grand Prix of his own. He found one, a beautiful blue 1974 SJ. He blamed the whole transaction on me! So for revenge, he conspired with Junkyard Life Brother, Anthony, and Jody to find me a Grand Prix. Darn them, they did. They found a few but I always turned them down for some reason or another. Just not the right car or the right time, until Anthony got the call. Scott found an incredible 1976 Grand Prix LJ on eBay and told Anthony to make me look at it. I did. Notice my new Ames Pontiac floor mats. Also, note the power window block-off plates. Cool! Say, is that African Crossfire Mahogany? Yes. Yes, it is. But... hello... remember me? The guy NOT wanting to buy one now. So, doing what someone who doesn’t want to buy a car does – I expanded the search and found this one. Oh, no! And it’s Valencia Gold! I could hear Scott and Anthony laughing deep in my soul. I still said no. He convinced me to bid on it. Actually, Anthony bid on it for me. I didn’t even look. Jody kept calling, telling me how many people were watching it. A couple of dozen, at least. That only assured me further that I was not getting the car. Surely, someone had that cheating software that outbids you in the last micro-second of the auction, thus most of us, mere mortals, could not stand a chance. Whew! When the bidding crossed the dollar amount that I had capped for the SJ (or thought I did), I relaxed. I was glad for whoever just paid a lot of money, but still a very fair deal, for a car of that caliber. I just didn’t know it was me. I will never forget when Anthony called to tell me what the car sold for. “Um... You did,” he replied. The SJ has a 455-V8 engine, that in spite of low miles and running really well, is in need of detailing, and as long as I am at that, I may as well replace and update wear parts like the pumps and gaskets. My list always snowballs when I put it into words. In my head it doesn't sound that complicated. 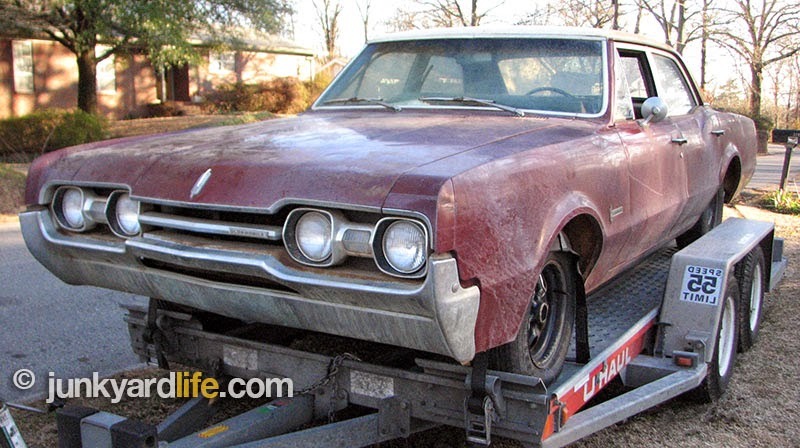 My Grand Prix, now known as Valencia, or Val, was in Batesville, Arkansas. The gentleman who owned it, and several other Grand Prix collectibles, met us in Memphis, Tennessee. I then became ‘Valencia’s Lesser Accomplice’ as Anthony likes to call me. So, what is this strange and beautiful Pontiac that has taken residence in the Junkyard Life shop? The car has the SJ package, that included the 455 engine and a rear sway bar. Equipped with rally gauges and the famous horse collar bucket seats. A beige interior that is really more of an “off-white” with a chocolate brown dash and carpets. Deluxe lighting package with a power trunk release in the lighted glove compartment. It has 3:23 gears, so it could use an overdrive. It has the way cool, finned hubcaps, that set off the classic Pontiac styling very well. Marshall, at Shawn Thorson Auto in Moody, Alabama, took an extra liking to Valencia. Marshall wet sanded and buffed, taking extra care of the original paint. It turned out better than I ever expected. Thanks, Marshall. My Grand Prix has Valencia Gold paint. No vinyl top (cool!) No cruise control (it will). No tilt steering (it will), and no power windows (I’m kind of glad). The ’73 Pontiac does have the optional cornering lamps, which I love. I find myself looking forward to turns on a residential street, so the cornering lamps will light up the signs. It also has some of the best African Crossfire Mahogany I have ever seen. If you don’t know what that is, African Crossfire Mahogany is a Grand Prix geek word meaning the wood grain on the dash and door panels. Bumper fillers and trunk dividers are still intact. I even got the original warranty papers in the deal. This luxo cruiser rides well and runs even better. I am really happy with what I got. This car was well cared for and preserved and I intend to continue the tradition. Plus, I kind of promised the last owner, who promised the previous, who promised the original. So what choice do I have? Who am I kidding, I would have anyway – I love these cars! Marshal at Shawn Thorson did such a good job on these wheels, that I am putting together a set of Rally II’s to swap out these occasionally to preserve them. The center piece is a bit faded, but there is zero curb rash on these babies. They really work on this color car. Imagine a set of red lines…. The Pontiac Grand Prix styling and trim levels, J and SJ, were borrowed from Duesenberg Automobile Co. I don’t know where LJ came from. I think it stood for “Luxury.” Weird. The last half of my #1 Fun Fact was an opinion. The LJ was introduced in 1975. The most distinctive feature was the two-tone paint. It seemed to include tons of luxury features, but the gauges and the 455 still had to be specified. 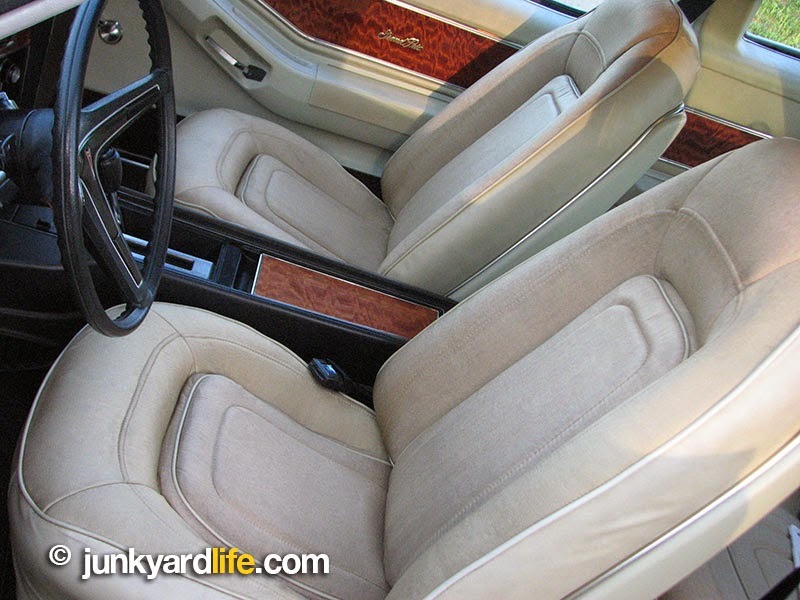 My favorite Grand Prix interior is the burgundy velour from the 1975 LJ. Now that’s a fact. And it's fun. Stutz, from 1969-1973, were styled after the Pontiac Grand Prix and not vice versa. 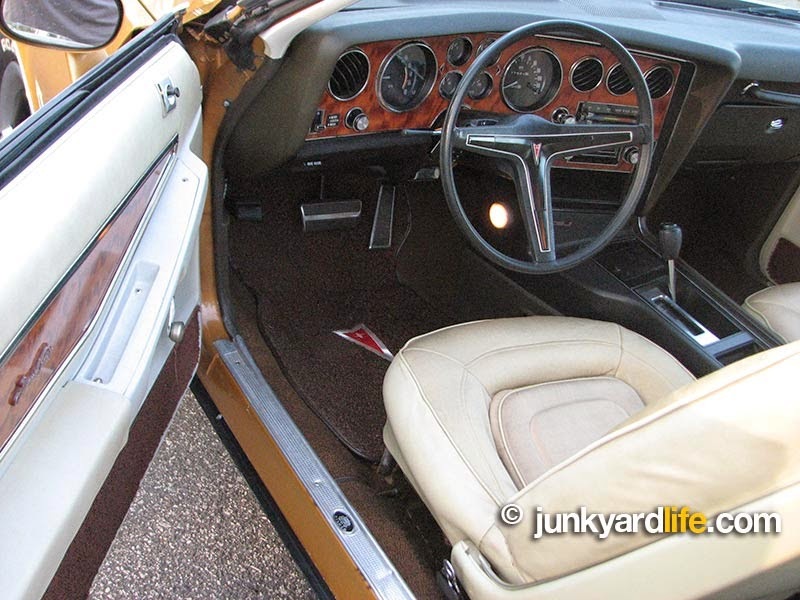 In the early 1970’s, Stutz didn’t try to hide it, they used Pontiac running gear – but, to be fair, they also used several other American drive trains. It is rumored that the first 1969 Pontiac Grand Prix off the assembly line was purchased by Stutz for re-styling and shipped overseas. In 1973, roughly one-out-of-every eleven Grand Prixs were of SJ trim. We named the car Valencia Julius McMullen because of …wait for it…more fun facts! 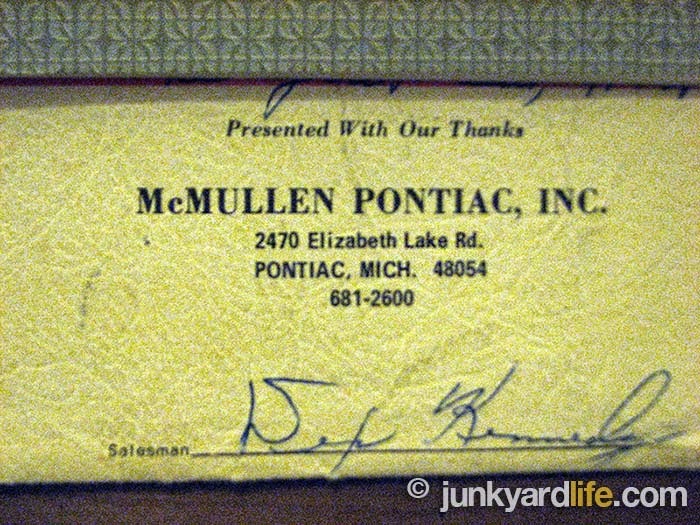 My SJ was delivered to the famous McMullen Pontiac in Pontiac Michigan. 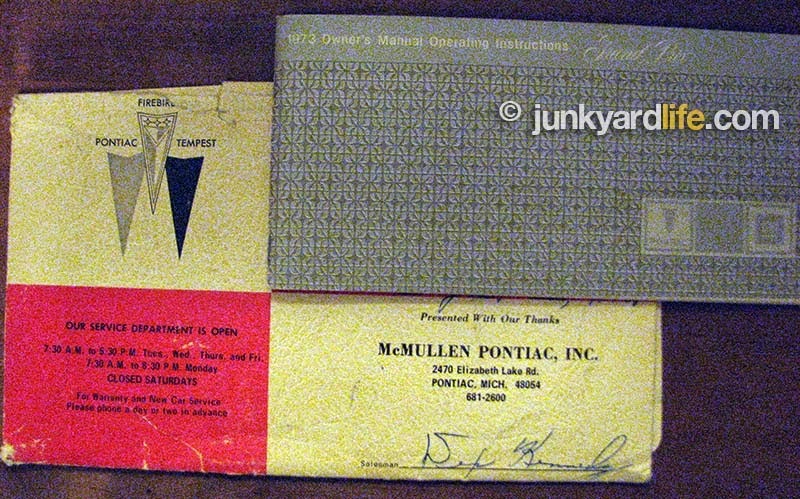 McMullen was the dealership where Pontiac employees took delivery of the cars they ordered for themselves. They built them, but they couldn’t sell them, so, McMullen handled that for them. The original owner was a project engineer for Pontiac. The SJ was a company car for him. He bought the company car for his wife when he got the next one. John DeLorean was his boss for many years. Early brochures state that a Grand Prix could be had with a Super Duty 455. Sadly, that option never came to be in the Grand Prix. If that would have happened, it would have been geared with a 3:42 axle ratio. One prototype that I know of, (black with a NACA hood) was built. 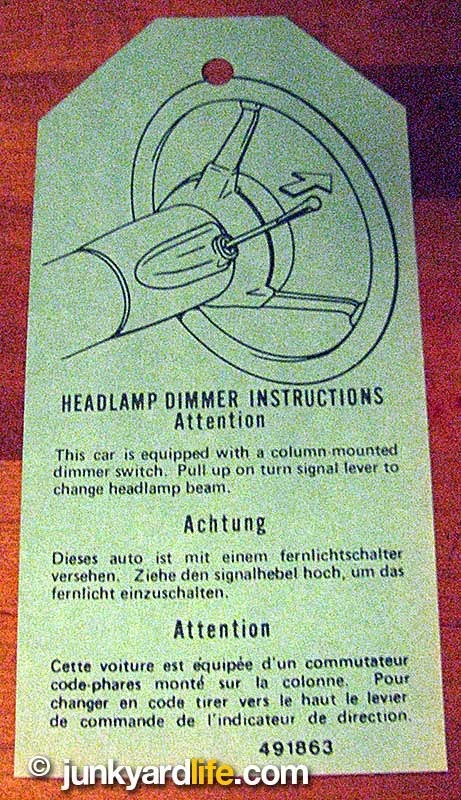 1973 was the first year for the headlight dimmer switch housed within the turn signal lever. This did not show up in the Firebird until 1979. Previously, it was activated by a foot action switch on the floor. 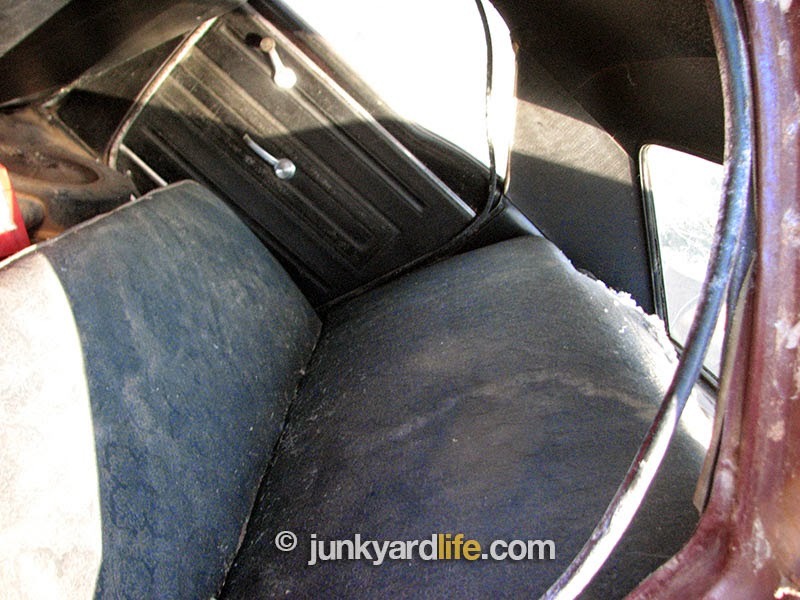 These seats are pure Pontiac heaven. Confession time, I knew that cloth was offered in the Grand Prix in 1973, but I have never seen it. I really thought it was just an option in the brochure that didn’t make it to the assembly line. I stand, or sit corrected! I lost my clock! The tach install went very well. Sort of. 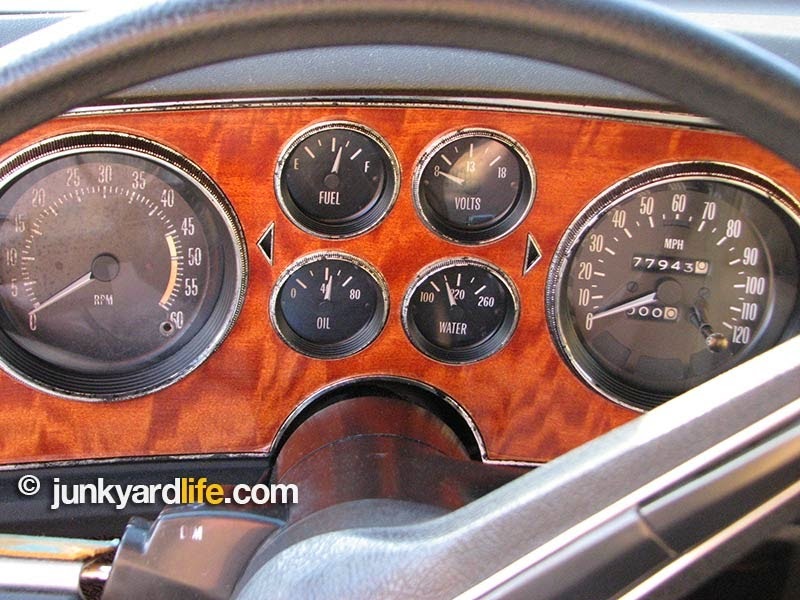 But now I have my ideal Grand Prix gauge cluster – the Rally gauges with a 120 MPH Speedometer, a trip meter and the every highly coveted... I waited for it... tachometer. I actually own the very cool original tag that hung from the turn signal in the dealership to tell owners where the location of the new dimmer switch. I am very proud of weird things like this. Pontiac treasures from McMullen Pontiac! 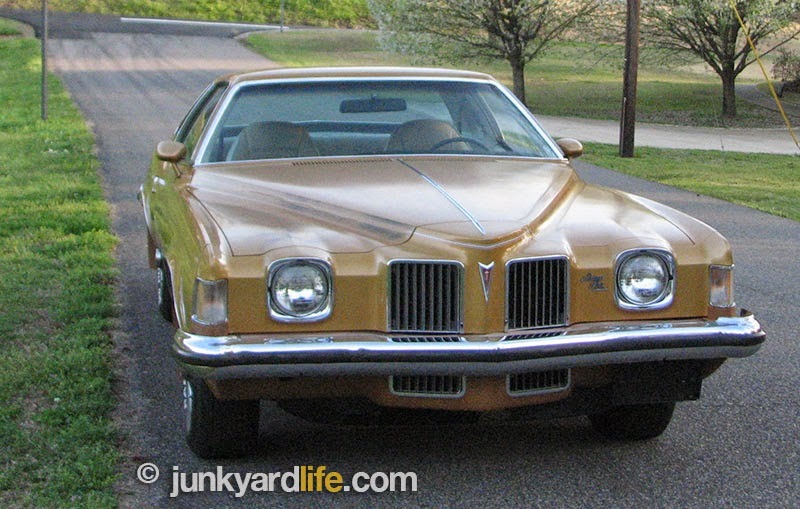 Original Valencia Gold paint shines on this 1973 Pontiac Grand Prix SJ. 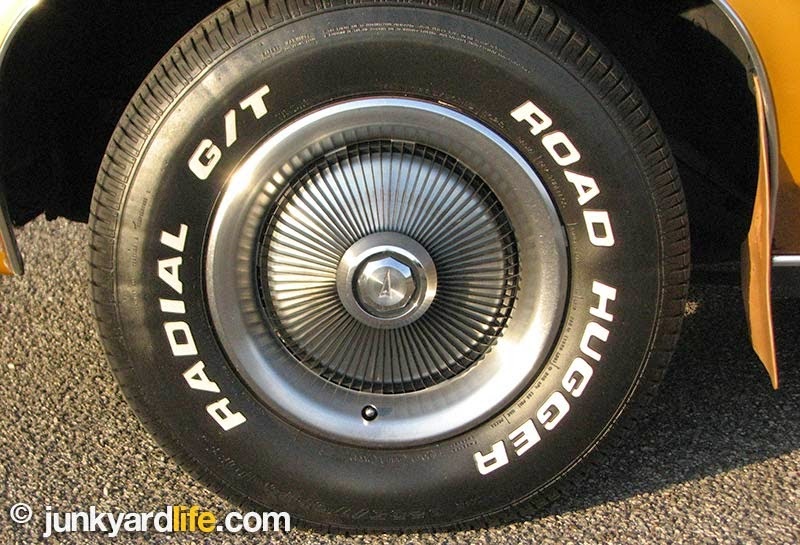 Similar, plastic-finned hubcaps were also available on 1973 Corvettes. 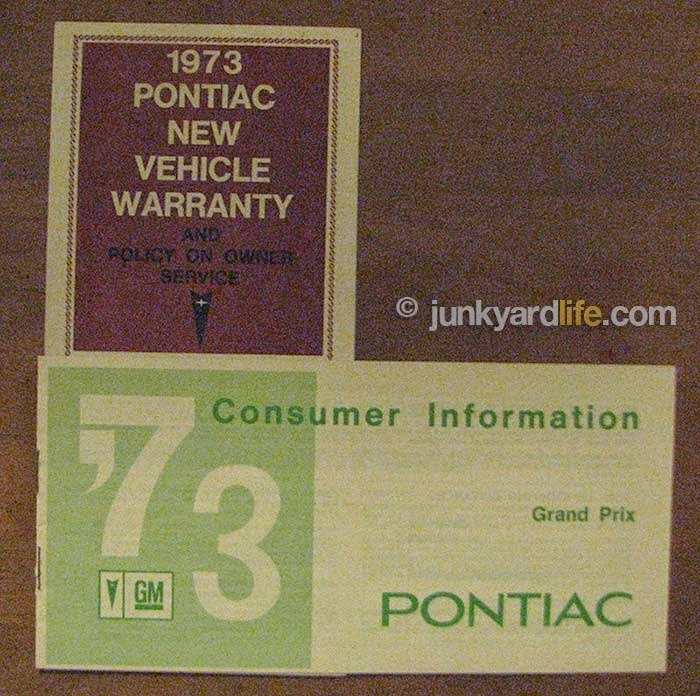 1973 Pontiac warranty books included. Ron Kidd and his 1973 Pontiac Grand Prix SJ will be cruising to the Pontiac Nationals soon. Olds it! Right there! Our Junkyard Life Brother and resident Oldsmobile parts source, Scott Johnson, has scored once again. 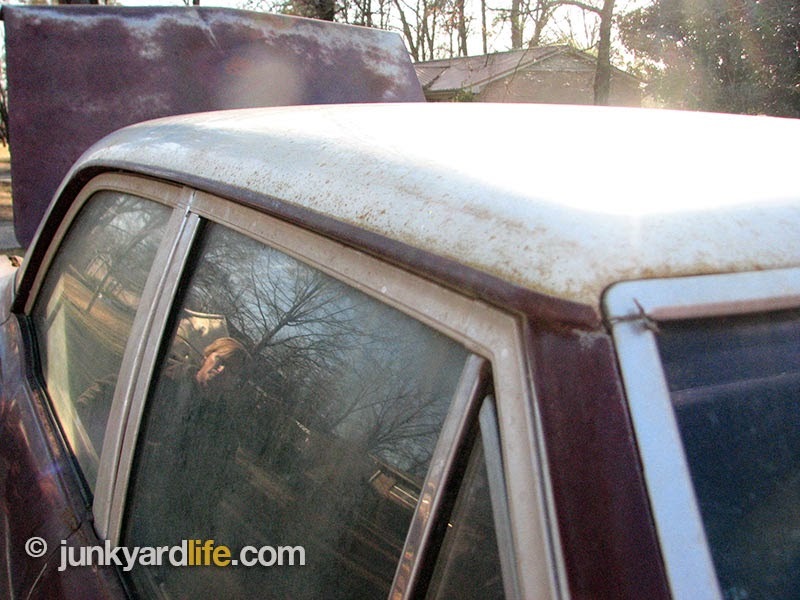 Scott showed up at Junkyard Life’s world headquarters with an awesome barn find – (almost) fresh from the barn. I couldn’t stop looking at this fabulous example of Oldsmobile history and American car culture. This car just fit right in! 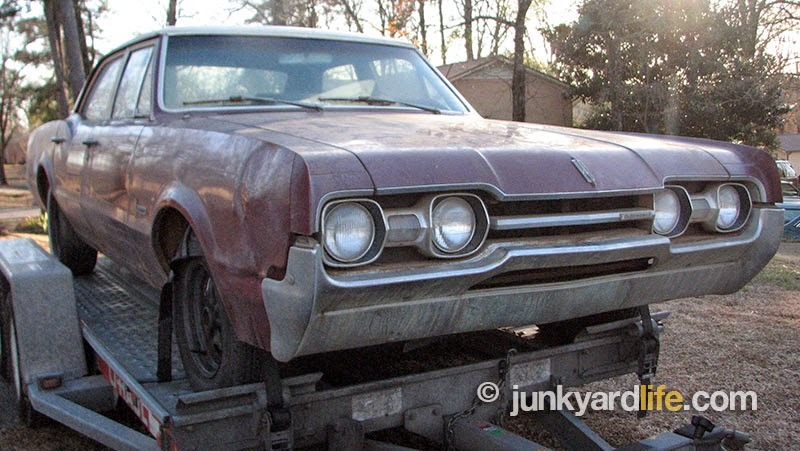 A 1967 Oldsmobile F-85! This one is a 4-door sedan, also known to enthusiast as a “Town Sedan” due to having the loved and hated post dividing the windows. F-85 was the designation for the base model, plain Jane, point-A-to-point-B, Oldsmobile in 1967. Living in the entry level spectrum with lower-priced models such as the Chevelle 300, Chevrolet Biscayne, Ford Falcon Futura and Dodge Dart. The F-85 was the best value Olds in the line-up. However, Oldsmobile wasn’t known for building basic cars. This F-85 STILL had options! Lets take a look at Scott’s F-85. 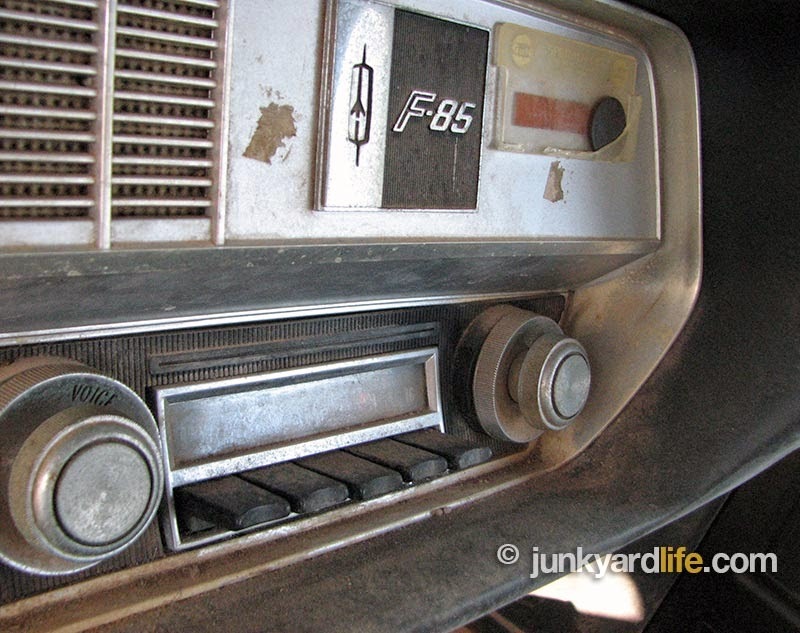 Push button AM radio and a really cool “F-85” emblem. Cool! Two-tone roof and painted drip rails. Expensive and cheap on the same roof? Immediately, we noticed the two-tone paint. An eye-relaxing, maroon and white combo. Very cool and I imagine that as attractive as it looks now, back in late June of 1967, it was simply irresistible on the showroom. Some lucky customer walked into Miley Olds in Sheffield, Alabama and thought the same thing. Paint codes N-C come back to the correct, as it sits, Burgundy Mist and Provincial White. But keep looking! This car also has air conditioning and power steering. I halfway expected it to have power brakes (it did not), although the brakes would have been drums and not disc. So, can you imagine paying for those options and yet, no carpet? It's true, most F-85 models did not even have carpet, just a utilitarian black mat for those who wore shoes in the 1960s. 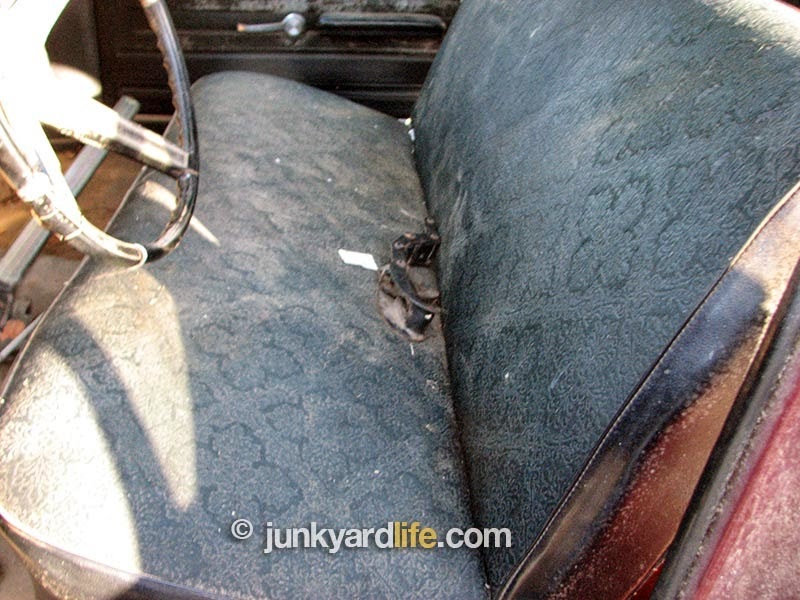 The Oldsmobile does have bench seats, front and rear, that are in great shape. The original AM radio lives in one of the most perfect dash boards we have ever seen. 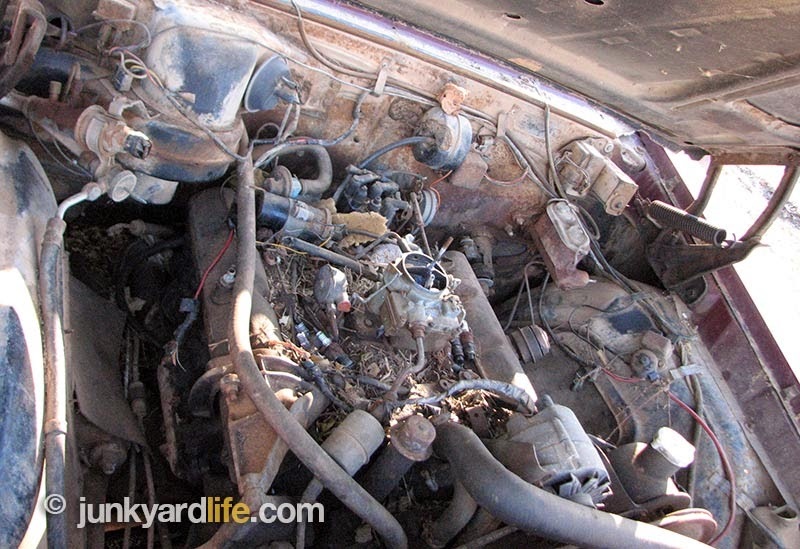 330 cubes of Olds Rocket power – even saddled with a 2-barrel carburetor the V8 pumped out 250 horses. This buyer did not settle for the six cylinder in this economy model. They checked one more box, scoring the 330 C.I.D V-8, making a very respectable 250 hp, even with a miserly 2-barrel carburetor. 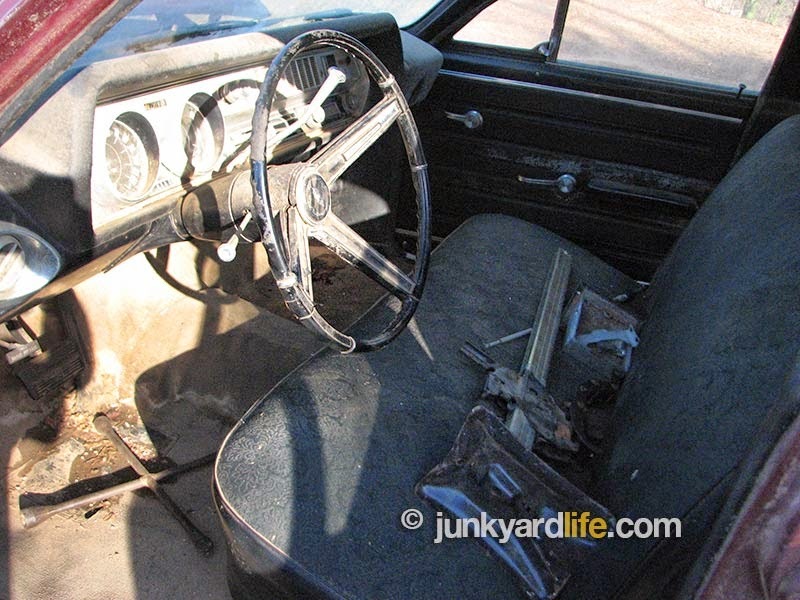 It even had the famous Olds Jetaway automatic 2-speed transmission. Drag racers love those now. Really, it doesn’t matter how this Olds was optioned. We would have loved it anyway. This Rocket is in great shape overall with no rust showing. We love it. Rip-free seats in otherwise great shape. I don’t know if that is the original material but someone knows! Tell me what you think. 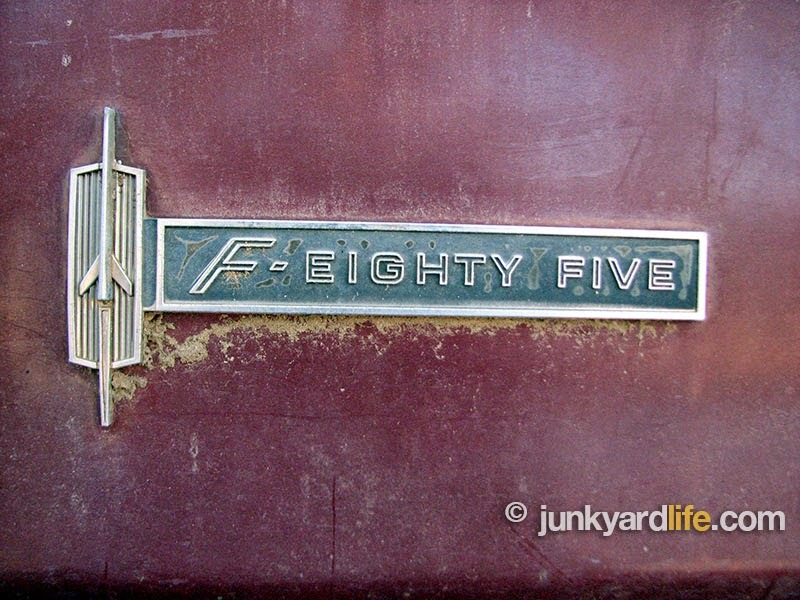 Olds F-85 emblem spells out “Eighty Five” on each fender. Rear bumper damaged in a prior towing incident. Fail! 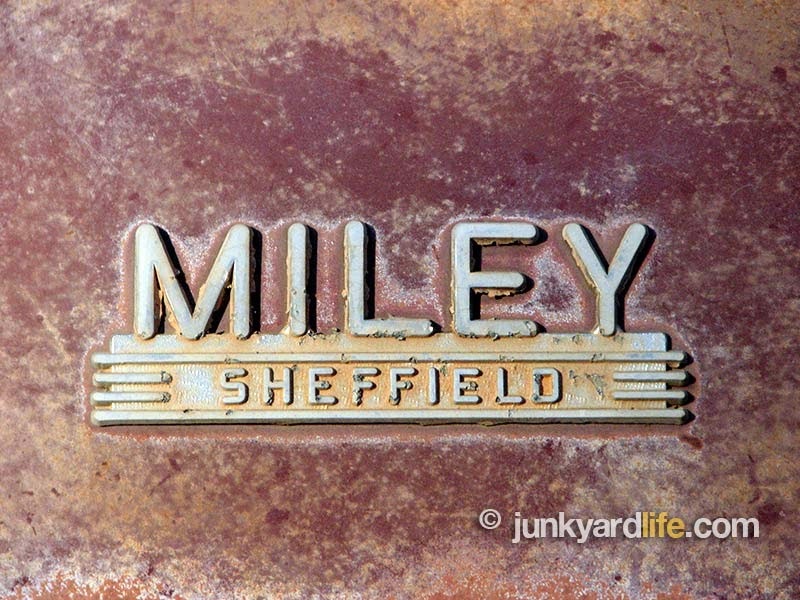 Original dealer emblem from Miley Buick-Olds in Sheffield, Alabama mounted on the 1967 Olds F-85. 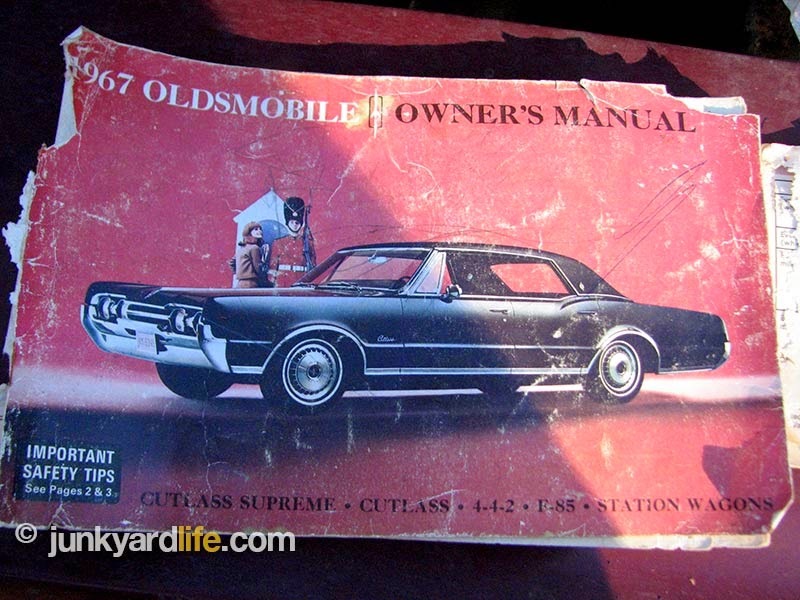 1967 Oldsmobile owner’s manual still tucked inside the glove box. Oldsmobile trunk or treasure trunk? Look what we found! 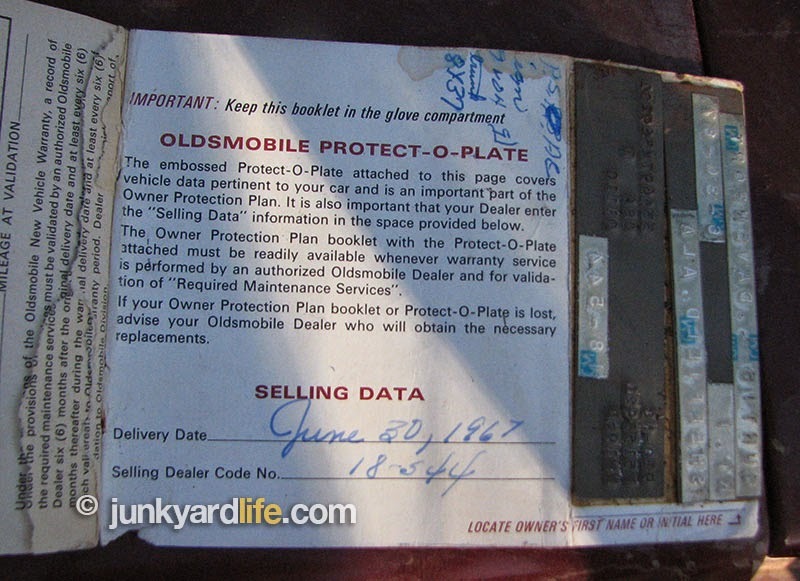 Yes, that is the original “Protect-O-Plate” warranty card and owners manual. 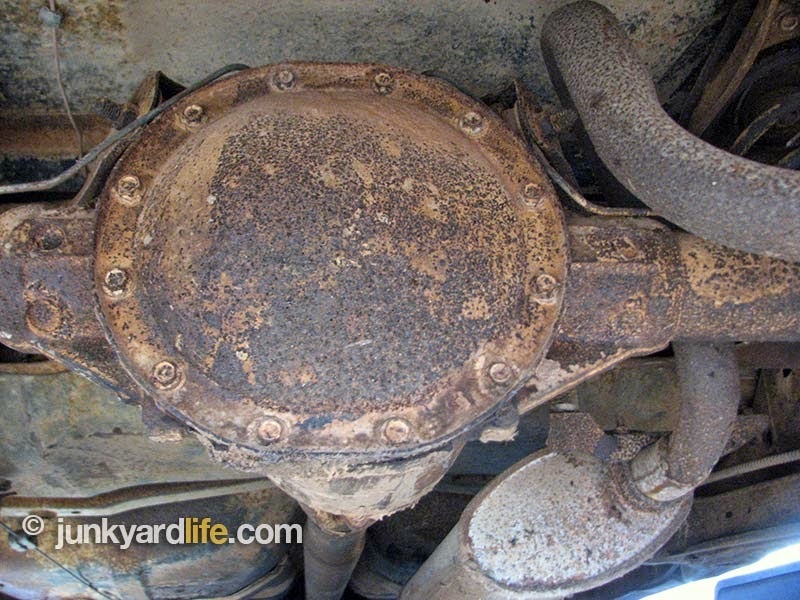 Think we could get GM to change the oil? I really embrace these kind of finds. Also, note the 12-bolt rear end. Maybe not the best one, but a great conversation piece. Scott Johnson is an Olds super fan. 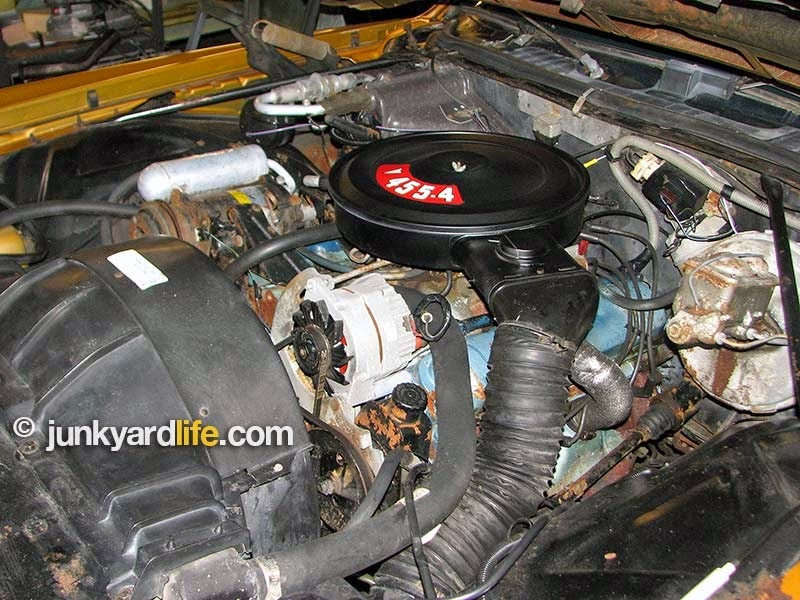 Read about his 1970 Olds 442. Big, red and rust-free. This muscle car era Olds will make a comeback. If this backseat could talk what would it say? Do you ever notice that 4-door’s interiors hold up better than the 2-door models?